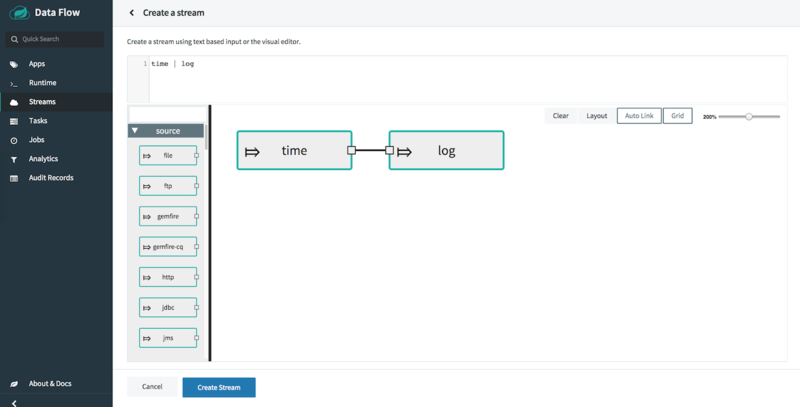 The Spring Cloud Data Flow server uses Spring Cloud Deployer, to deploy data pipelines onto modern runtimes such as Cloud Foundry and Kubernetes. A selection of pre-built stream and task/batch starter apps for various data integration and processing scenarios facilitate learning and experimentation. Custom stream and task applications, targeting different middleware or data services, can be built using the familiar Spring Boot style programming model. A simple stream pipeline DSL makes it easy to specify which apps to deploy and how to connect outputs and inputs. The composed task DSL is useful for when a series of task apps requires to be run as a directed graph. The dashboard offers a graphical editor for building new pipelines interactively, as well as views of deployable apps and running apps with metrics using Prometheus, InfluxDB, or other monitoring systems. The Spring Could Data Flow server exposes a REST API for composing and deploying data pipelines. A separate shell makes it easy to work with the API from the command line. An easy way to get started on Spring Cloud Data Flow would be to follow the platform-specific implementation links from the table below. Step 2 - From the directory where you downloaded docker-compose.yml, start the SCDF system. Step 3 - Open the dashboard at http://localhost:9393/dashboard. Step 4 - Use 'Create Stream(s)' under "Streams" Menu to define and deploy a stream time | log with the name 'ticktock'. Once the ‘ticktock’ stream is deployed, you will notice two stream-apps (ticktock.log and ticktock.time) under the "Runtime" tab. Click the i icon of the 'ticktock.log' app to copy the path of the streamed logs.